Native advertising has been gaining popularity in great strides among marketers, in the last few years. This is due to its reported superiority to traditional advertising, including banners, in-app ads, etc. We shall investigate its purported merits and shortcomings. If we are to pursue an even deeper insight, into peer reviewed articles, we find that Colin Campbell and Joseph Marks, in their 2015 paper “Good native advertising isn’t a secret”, describe native advertising as “desired marketing communications that appear in-stream”. As we can see, even though there is no single strict definition, different source usually gravitate around the concept that native advertising represents ads designed to blend in the environment they are placed (be it either off- or online). Offline advertising has taken many forms in the past. Take the American symbols as examples – from the ragged paperboy shouting ‘Extra! Extra!’ trying to sell his stack of papers, to the billboard and flashy signs spangled Time Square. The advent of the global web unveiled a whole new world before marketers. In the beginning, however, the practice was for companies to simply transfer their offline practices to the online world – uploading their catalogues and flyers. This was done mainly in an attempt to reach bigger audiences and eliminate one of the biggest hurdle of offline advertising – time constraints. Now people did not have to wait for the TV spot they liked to be aired again, they could simply go online and see the information they needed. Ad banners were the superstars of the 90s and early 00s. Everyone who knew how to use a computer mouse was clicking on banners back then and the CTR and ROI (click through rates) were through the roof. All good things come to an end though and internet users developed the so called banner blindness and people just stopped noticing the once allmighty banners. Since then, many techniques for online marketing have risen – social media ads, in-app ads, influencer advertising – and they can often times synergize well (as we will see later). But let’s go back to our main focus today – native advertising. Due to its recent growth in popularity, it may be tempting to think that native advertising is a new phenomenon. It is not so. The great David Ogilvy and many other marketers of his time were using this “soft sell” technique in print publications all the way back in the 60s and 70s. Content such as this one, was in the form or articles and was placed among other similar articles in print press. For Ogilvy it was important to provide value for the audience without being intrusive. And his ads did just that – they provided useful information, just as a normal article would, they did not interrupt the experience, while still promoting the company. They looked just like another post on your wall apart from the small label “suggested post”. These fall under the “in-feed” type of native ads. Naturally, shortly after, companies dedicated to managing this type of sponsored content, began emerging and became dominant forces in the field. Outbrain, even though founded before the whole native ad thing, was the first big company that specialized in this ad type. The New York based company rapidly gained popularity and became the leader. Soon after, Taboola entered the market competition and managed to secure accounts such as BBC, USA Today, Boston Globe and others. In 2013, the third biggest and fastest growing network (according to their own claim), RevContent emerged and they currently reach up to 250 billion recommendations per week. Google has only recently decided to fully adopt native advertising. Later this year Google should implement “Responsive Display Ads” – the service will only require a URL, an image, a description and a headline and it will automatically create the needed ad format, based on the shape of the spots available. After all, according to the definitions stated earlier, these search results are to be considered native advertising, since they correspond to the intended search results and it’s natural to see them among the search results. Many big YouTubers’ channels have also become a breeding ground for native ads and in turn the YouTubers themselves have become influencers among their network. For instance, influencer Aaron, over at his YouTube channel “alpha m.”, is famous among his audience for sneaking in product promotions in his videos. In this case his Peter Manning spot at 1:20 to 3:15: youtube.com/watch?v=FBScY4ndwI4. Again, if the video lacked the blatantly commerical spot, it would still offer exact same value for the watcher, and the promotion was not intrusive, rather it was very well placed and is very likely to add to the value of the video. Why is native advertising so important? The success of adoption of native advertising was unexpected by marketers. It defied the paradigm of the time, that an approach of unobtrusive nature could be successful. Actually, it wouldn’t be so unexpected if most marketers followed a little bit more logical thinking and realized how “banner blindness” was bound to occur sooner or later. But then, if display ads have gradually lost their rate of efficiency, shall we expect native advertising to wear off too, after some? 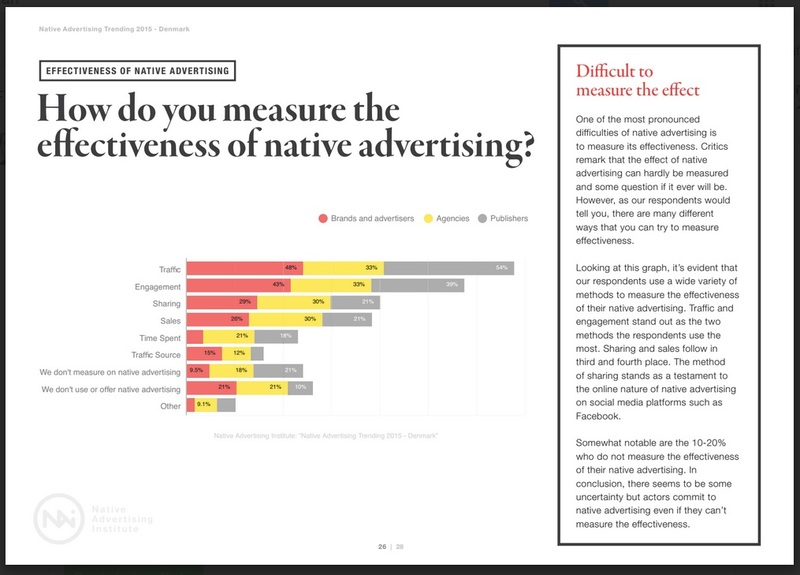 Sharethrough and IPG’s experiment on native ads from National Geographic and Southern Comfort demonstrated that in relation to banners, users pay up to 53% more attention to native ads and their purchase intent was 18% to 53% higher. Whichever stat is valid, if we also take into consideration Advertising Age’s projection of $8.8 billion investment in native ads in 2018, we could say that, at least for the time being, it’s early to predict a demise of native advertising.. However, native advertising is not completely void of distraction (after all it’s pretty much impossible not to distract viewers at all). Many users report that they feel “tricked” after they’ve finished reading an article only to realize that it’s been a prolonged ad copy. In fact, up to 54% of users do not trust sponsored content, according to a study by Contently, surveying 542 US Internet users in the 18-56 age bracket. This is attribute to people’s belief that, since an article is labeled as “sponsored content” the sponsor would have an influence over the content and it may be distorted to the sponsor’s benefit as a result. Readers feel that they are actually consuming an ad rather than standard content that went through editorial. The mentioned study also concluded that these distrust levels increase with the education level of respondents. But if certain content is distracting in some way, does it really mean native advertising inherently becomes inefficient? Purchase intent data related to native ads reveals that actually 70% of users prefer to learn about products through content. Therefore we could speculate that if you distract users in the correct way, people may actually be glad that you “tricked” them into informing them about a product choice they had been conteplating anyway. When to apply native advertising? Before thinking when and how to apply native advertising, we should take a step back for a moment and take a look over the big picture, asking ourselves whether it is advertising that we need to connect with our prospects or maybe, some different approach such as PR or direct recommendation channels (e.g. a doctor directly recommending a particular medical laboratory to his patients, upon assigning medical tests). As a rule of thumb, the more “service-like” is your value proposition, the more you’d need PR -oriented approaches and the more “tangible product-like” is your propositionm the more advertising makes sense. An interesting case are announcements (e.g. opening a new store/ launching a new product version/ etc), which could benefit fairly well from both approaches. – John wants to get a new haircut. But since the hairstyle he wants is very complicated, he needs to choose which barber to visit, as what he wants is very custom and probably not everyone will be able to fulfill his need. Therefore, John ’s choice will be mostly influenced by PR and even word-of-mouth (WOM), as what he requires is a service (a high-involvement one at that, since he would be directly communicating with the barber eye-to-eye). Therefore, if you’ve decided that it is a matter of advertising for your particular value proposition, then let’s consider when and how native advertising would be appropriate. How to apply native advertising? To get a better idea of how and why native advertising is a novel concept, we can take a look at the AIDA model, according to which the natural consecutive phases in the selling process are awareness/ interest/desire/ action (and later, retention was proposed as a logical next phase). In the case of native advertising, however, the ‘awareness’ element does not always come first. If certain content is not marked as ‘sponsored’ or ‘promotional’ the viewer may not realize that its goal is to promote a certain product/ brand until the end (hence, why people tend to feel tricked by native advertising, as mentioned earlier). So, in cases such as this, the awareness stage comes after the “interest” or even “desire” stage. What this means is that the content should be interesting and engaging for the user by itself in order, for the promotion at the end, to be effective. For if visitors are bored by the content, they may not even reach the promotional element. – Form – does the ad go with the flow of the environment it is put into? Do the users have to get their attention off the usual content or the page they are browsing? – Integration – what happens when users click on the ad? Are they sent to a page on the same website or does a whole new website open? – Buying & Targeting – does the ad only appear on a certain website or is it spread across multiple sites and pages? This one may be crucial for your business. If your offering is a niche one, you would want to be as narrowly focused as possible with the placement of your native ads. Conversely, if your product/ service covers a broader population, you might want to spread the ad as far as possible. – Disclosure – is the content clearly marked as “sponsored” or “promotion material”? Also, does it clearly show which brand is being promoted? – Measurement – what are the metrics or key indicators to judge success? Now let’s talk metrics. When digital advertising is concerned, CTR (or just “traffic”) is oftentimes the metric that first comes to mind and is the most widely adopted one, as is evident from a survey conducted by the Native Advertising Institute. This does reflect our inner impatience with results speaking. CTR may not only be utterly irrelevant, but misleading, as well. Since a big chunk of native content tends to be a part of a bigger immersive experience – a story among a website full of stories, a video among videos, etc., the impression left on consumers about your brand is likely to be a long lasting one, even if they don’t take immediate action. Therefore, acquisition, which is not necessarily about the sale – it may be about someone giving you their email, filling a request form, a quote request, etc – may be a bit less inaccurate measure. Our advice would be to focus on formulating the hypotheses of why you would expect your target audience to take interest in your native ads and construct metrics about observing or not observing the hypothesis-predicted consumer behaviour. Native advertising can be a powerful tool for the success of your business and for that purpose it is important to apply it in a well planned, conscious manner, rather than mechanically replicate what your perceived top competitors are doing.